Spring is the time for new life and rebirth. It is filled with warmer weather and beautiful flowers. Personally, I think spring is the perfect time for a busy mom to treat herself to some new goodies as well. There are a few spring must haves for moms that I really believe every mom needs in her life! We all deserve a little treat once in a while, so go on girl treat yo self! I have been subscribed to Fab Fit Fun for well over a year now, and I have never been disappointed. They are a quarterly subscription service, so you get a box four times a year. Each box is filled with awesome full sized products perfect for the season. The value of the box ALWAYS heavily outweighs the subscription cost. Right now, if you go click HERE and use the code SPRINGTIME, you will get $10 off of your first box! Fab Fit Fun is probably my all time favorite subscription box and number one spring must have. Out with the old and in with the new! I love doing a wardrobe upgrade around springtime for myself and the kids. The problem is I don’t want to spend a ton of money. Enter Thredup, an online consignment shop for women and children. I love to get one of their clean out bags, stuff it full and send it in. Once I have my payout, I will go on my own little shopping spree. Their items are all like new and brand name, many of them still have tags on them! They have everything from clothes to shoes and even designer handbags! Check them out, HERE and get $10 towards your first purchase! A recent discovery of mine has been the Book of the Month Club. It is another subscription box, but you get a book every month! 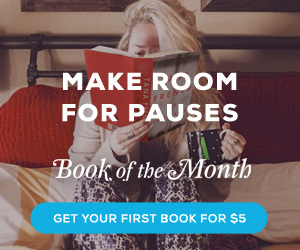 You can sign up and pick out one of their books they have available each month. If there isn’t anything that tickles your fancy, then you can simply pass for a month and you won’t be charged. To me, a good book to relax with is a definite spring must have. Look, not every mom wants to cook every night. It can become tedious and it is easy to get uninspired. Thankfully, this is where food subscription services can come into play! There are so many services out there, but my two favorites are Sun Basket and The Home Chef. Both of these are awesome. They send you everything you need to make some delicious meals without the hassle of shopping and meal planning. Both of them are easy to customize as well based on any dietary restrictions. Sun Basket is also offering three free meals right now to new subscribers! Every mom deserves to be pampered and feel special. That is what this list of must haves aims to do. Everything mentioned will make mom feel that spring time joy and relax a little on top of it. Now I want to hear from YOU. What are your spring time must haves? I just went out and bought some new clothes this past weekend. I needed some new tops and capris for spring. These sounds like good spring must haves for any woman! I love book of the month club, everyone should definitely check that one out! I love the idea of using the spring as a chance for a mini wardrobe makeover! Just picked up a couple new, awesome pieces last weekend myself! These are all great things for moms to get! I think a pedicure is something that I find to be a must have. I only get one once a year, and spring is the perfect time! I love Fit Fab Fun and have been doing it with my daughter for at least a year. I buy her subscription for her birthday. I’ve recommended Sun Basket to my clients before. I haven’t used them before, but they seem great. And like you, I love a good book. As a member of Amazon Prime, I’m so happy I get a free book every month. Some of them have been pretty good. New clothes and a good book is me!! I love to read and I do need some new clothes to freshen up my closet! I need to get myself a new book, so that’s awesome!! I also would like to try one of those services that send you the groceries to cook. Sometimes, I just don’t have time to go to the store and I don’t know what to make! I don’t necessarily have to have new clothes. I am not that material. But, a new book, wouldn’t be so bad. I will run out of books before my clothes wear out! I love Book of the Month. I had a subscription last year but put it on pause to catch up on books. I need to sign up for it again. Spring is the perfect time for new clothes, especially with all the fun fashion trends showing up this season. I have a full time job and I wish I had some extra time to enjoy spring. But yes, I do dress up for spring. Love this! Spring is definitely a good time to get new clothes and freshen up your look and closet! I always need new shorts and some summer shirts this time of the year. I am also usually due for a hair cut too LOL! I haven’t tried subscription boxes before but this sounds like an good one. I am more interested in the meal boxes as I write a food blog. I’d love a food subscription service to make those busy nights easier! I’m going to have to check out Sun Basket, I haven’t heard about that food subscription option before. It’s also good to hear that Fab Fit Fun doesn’t disappoint. I love a good book, so I will definitely be checking out the book club. Thanks for these tips! I completely agree with you about buying new clothes. As a matter of fact, I just did a ton of online shopping for spring clothes this past week. I love getting new clothes for the new season. These are all awesome. A new book to read is always exciting! These are some great must have’s not just for moms 🙂 (Not a mom yet, but I love all of these). I love Spring is my favorite season followed by Fall 🙂 I also love shopping for new outfits for spring which I end up using for summer as well!